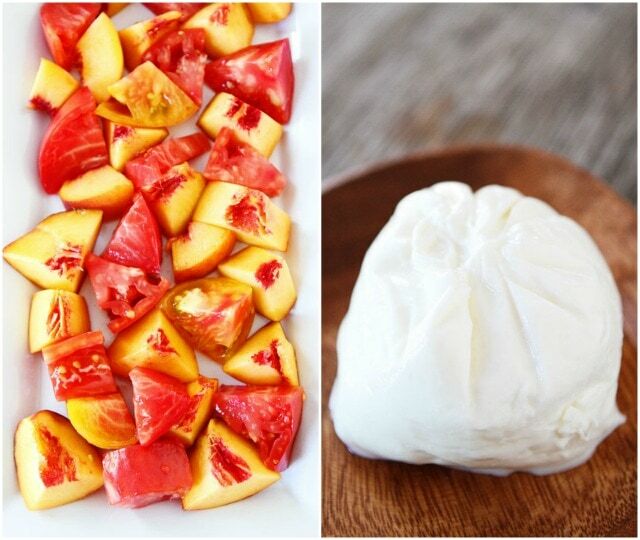 You only need 5 ingredients to make this gorgeous Tomato, Peach, & Burrata Salad! I love that you only need five ingredients to make this salad. It is so simple, but sometimes simple is best, especially when summer produce is at it’s peak. The fresh ingredients do all of the work! 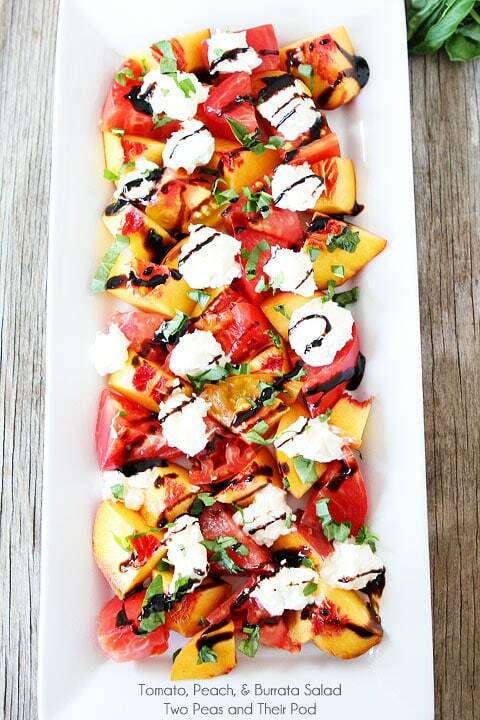 To make this salad you need: tomatoes, peaches, basil, burrata cheese, and balsamic reduction. That is it! You can use any variety of tomato for this salad. I went with heirloom tomatoes because they are so pretty! I cut the tomatoes and peaches into chunks and placed them on a platter. 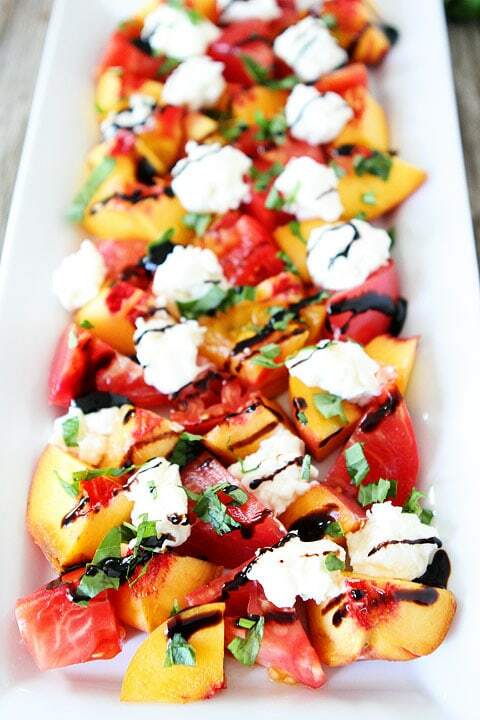 I added drops of burrata cheese, fresh basil, and a drizzle of balsamic reduction and BOOM! Look at how gorgeous this salad is! It only takes minutes to make…and minutes to eat. I have a hard time savoring this salad because it is so good. I could easily eat the entire platter by myself. 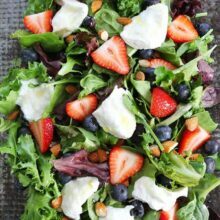 I love making this salad for a light lunch, dinner, or when we are entertaining. This fresh and simple salad is great for a light lunch, dinner, or party appetizer! To make the balsamic reduction, pour the balsamic vinegar into a small saucepan. Heat over medium-high heat and bring to a boil. Reduce the heat to low and let simmer, swirling the pan occasionally, until reduced to about half of the original amount, about 15 minutes. Remove from the heat and set aside. Meanwhile, place the tomatoes and peaches on a platter or plate. Top with burrata cheese chunks and basil. 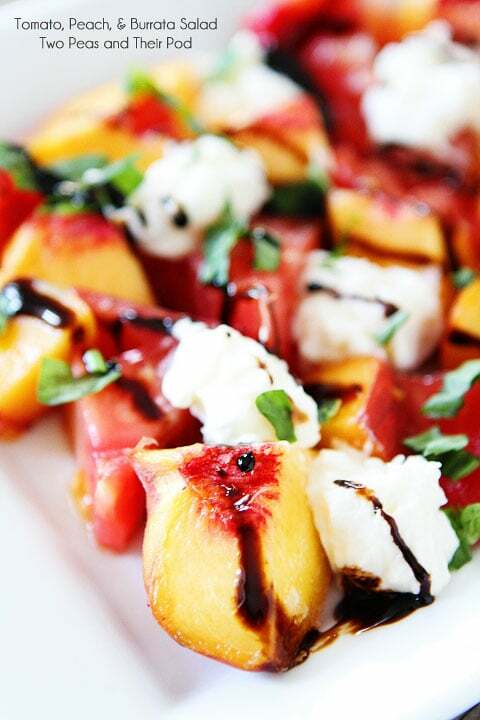 Drizzle the balsamic reduction over the salad and serve. Note-you can find burrata cheese in most grocery stores in the cheese section. If you can't find it you can substitute fresh mozzarella. Burrata cheese is very soft and will not slice well. Just add the creamy chunks to the salad! Maria I LOVE THIS! I’m a huge fan of balsamic vinegar/reduction & burrata is such a hot thing right now. I see it in every food mag I open. Pinned! I just made a salad like this yesterday! I am sooooooooo loving peaches right now! So amazing! Great recipe! Have a nice weekend!! Burrata is one of my favorite things in the entire world 🙂 Lovely combo! This looks like it would be a definite hit in my house! LOVE all those colours! What are the chances that you would post this recipe today? I just discovered burrata at the Vermont Cheesemakers Festival…had a chance to sample freshly made burrata, and I am in love! Combine burrata with peaches? Oh my…. Maria! This salad is ABSOLUTELY gorgeous!!! And sounds absolutely delicious! I’ve never tried burrata, but now think I must ASAP! I haven’t tried burrata yet. Looks like I’ve been missing out. GORGEOUS!! Wow, just stunning!! I love this salad! Oh how special and beautiful this salad is!!! Wow! What a great way to enjoy summer! Love burrata and love how beautiful this salad looks. 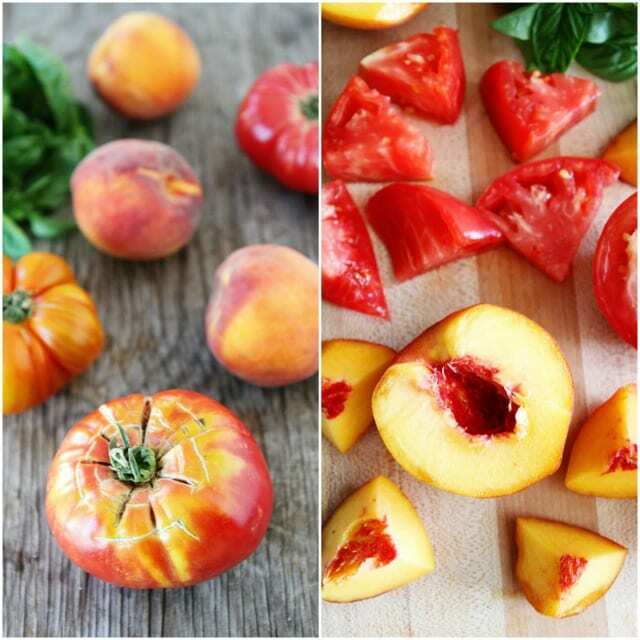 I’m a big fan of seasonal eating, especially from my farm share, and this combination of tomatoes and peaches (two great summer fruits that taste best locally) sounds just amazing. omg – this is seriously so gorgeous!! WOW…stunning! Seriously gorgeous. Such a gorgeous salad and so delicious! Now I know just what to do with those peaches I bought! Thanks for sharing such a great salad recipe. Yep, this is delicious looking. I love making a nice salad like this on a clean, prep table. Salads are great because it’s not confined to just one thing. Your site is a great example of this. 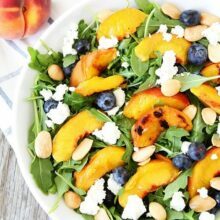 Such a pretty & refreshing summer salad! Absolute perfection! This is definitely my kind of summer salad! Perfect for entertaining. 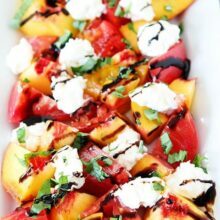 Gorgeous summer salad, loving the burrata and balsamic reduction! I think I need this RIGHT NOW. Looks SO delicious. 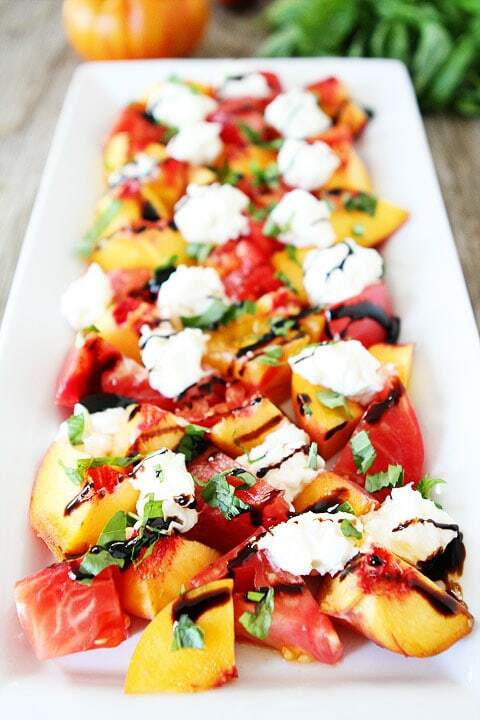 I have been addicted to nectarine caprese this summer, and this looks like a similar/fun variation. Can’t wait to make it! What a treat for the summer! What a gorgeous salad!! I’ve never heard of the cheese. I’m going to have to look for it now. Beautiful seasonal salad! This would be a great opportunity for me to try burrata. I heard it is creamy and light. YUM! Stunning salad Maria! And I’m with you on the whole burrata thing. I have a thing for mozzarella and burrata is seriously the best of the best. This is the second tomato and peach combination I have seen. Those colors are gorgeous! This is why I love summer. OMG YUM!! Summer on a plate. I could almost certainly eat this entire platter also! All of my favorite fresh summer flavors are in here! what a great salad. I usually have mine with goat cheese! Burrata….I have a light obsession to it! These look amazing. 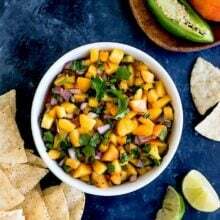 I’ve been trying to incorporate peaches into my cooking lately because they smell so good when I walk by them in the store. This sounds wonderful a nice mix of ingredients from the veggies and the fruit the cheese I’m sure adds a nice creamy texture to the mix. WOW! Amazing dish! I never post comments, ever, but had to for this one. Best salad I have had in years! Healthy too which is a serious bonus. I couldn’t find the burrata cheese so I subbed goat cheese and added thinly sliced red onions. Served with French bread which was nice to soak up the balsamic reduction. Heavenly. Thank you! Glad you liked the salad! The amazing photography is what drew me in. Based upon that alone, I will be giving this a go soon. Pingback: Every 4th of July Cookout Recipe You'll Ever Need - What Dress Code? 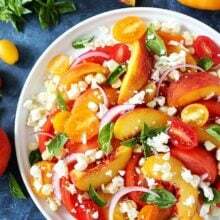 Hi ~ Just to let you know, your salad is featured in a collection of recipes I call “Pretty Ways to Serve Summer’s Best Tomatoes”. It’s here — http://kitchen-parade-veggieventure.blogspot.com/2015/07/pretty-ways-to-serve-tomatoes.html. Lots of ideas, all beautiful! I came across this recipe back in Aug and had to try this. I did over Labor day weekend and my girlfriend and I loved this. This is so delicious that this will certainly be a part of my summer dishes for sure to share with everyone! I have made this countless times since you posted it and LOVE it! I admit I cheat by using a bottled balsamic reduction and while I love it best with burrata-it also works really well with fresh mozzarella. I don’t hesitate to sub it if I have that on hand. Thanks for this and all your great recipes! My favorite and most used food blog! Have you ever made this to take somewhere? Wondering how well the opened burrata will travel. It should be fine for awhile. If you are traveling far, you could wait and add the burrata. I kind of have a burrata obsession. Had a last minute lunch for my super picky family and it was gone in 30 seconds everybody was obsessed!!! Didn’t even have time for a pic!